High blood pressure (HBP) or hypertension is a serious condition that can lead to coronary heart disease, heart failure, stroke, kidney failure, and other health problems. Blood pressure is measured as systolic (sis-TOL-ik) and diastolic (di-ah-STOL-ik) pressures. "Systolic" refers to blood pressure when the heart beats while pumping blood. "Diastolic" refers to blood pressure when the heart is at rest between beats. Blood pressure doesn't stay the same all the time. It lowers as you sleep and rises when you wake up. Blood pressure also rises when you're excited, nervous, or active. If your numbers stay above normal most of the time, you're at risk for health problems. The risk grows as blood pressure numbers rise. "Prehypertension" means you may end up with HBP, unless you take steps to prevent it. There are eight main ways you can control your blood pressure. Whether you have been diagnosed with high blood pressure, also called hypertension, or are concerned because you have some of the risk factors for the disease, understand this: while there is no cure, high blood pressure is manageable. Adopting a healthy lifestyle is critical for the prevention of HBP and an indispensable part of managing it. Think of these changes as a "lifestyle prescription" and make every effort to comply with them. Even if your blood pressure is normal (less than 120 mm Hg systolic AND less than 80 mm Hg diastolic) and your goal is prevention only, the lifestyle modifications provide a prescription for healthy living. If your resting blood pressure falls in the pre-hypertension range (systolic - top- number between 120 and 139 mm Hg OR diastolic - bottom - number between 80 and 89 mm Hg), your doctor will recommend lifestyle modifications. These changes may reduce your blood pressure without the use of prescription medications. There is no healthy level of high blood pressure. Don't take life-or-death chances with this disease. Instead, take responsibility! Work with your healthcare professional to determine your treatment goals and map out your best action plan for HBP prevention and management. 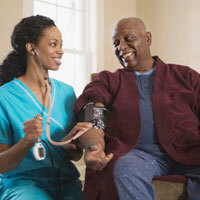 Of all people with high blood pressure, over 20 percent are unaware of their condition. This symptomless disease could leave them with substantial health consequences. If you don't know, see a healthcare professional to be tested. If your blood pressure is 140/90 or higher, your doctor will likely prescribe medication in addition to lifestyle modifications. Follow your healthcare professional's recommendations carefully, even if it means taking medication every day for the rest of your life. High blood pressure is a lifelong disease, and by partnering with your healthcare team, you can successfully reach your treatment goals and enjoy the benefits of better health. Once your treatment program becomes routine, maintaining a lower blood pressure is easier. Remind yourself that by managing your blood pressure, you are lowering your risk of heart attack, heart failure, stroke, peripheral artery disease and kidney disease. Death rates from these diseases have decreased significantly, thanks in part to earlier and better treatment of HBP. Managing blood pressure is a lifelong commitment; make a pledge to do so starting today for yourself and for those you love. Listen to your doctor, read the sound medical information on this site, and act on the information to live a heart-healthier life.